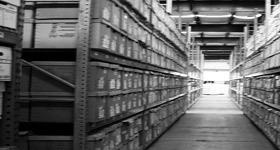 Our state-of-the-art records center combines secure, environmentally-controlled storage and efficient records management with fast, courteous, professional service. Offsite Data Depot utilizes an efficient shelving system constructed of solid steel with cross-braced beams that are bolted to the ground to ensure file safety in an earthquake. Thousands of sprinklers are placed throughout our record center and our servers are backed up daily, both to back-up servers and to an offsite facility. 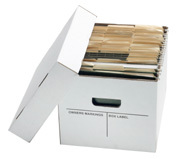 There truly is no safer place to store your important files than at our facility. Offsite's sophisticated data management system utilizes bar coding technology to track and monitor records, allowing us to locate and retrieve any file within minutes. Utilizing handheld wireless scanning wands, every movement of your files and containers is recorded and tracked, leading to 100% accountability. Offsite's customized fleet of vehicles transports records to and from your office securely and efficiently. We keep our trucks and vans clean and in top shape as a reflection of our respect for you and your records. Our drivers are specifically trained to properly handle them. We offer same-day delivery on requests before 11 a.m., and rush service within 20 minutes. Emergency service is available 24 hours a day, seven days a week. We understand that sometimes it's more convenient for you to come by and view your records without bringing them back to your office. If you would like to come to our facility to work with your files, you will be our guest in our on-site customer work room at no charge. We want to accommodate your work habits, not make you work around ours. Free to all Offsite clients, our Web Access service allows you secure, 24-hour access to your records right from your desktop. This allows unsurpassed accessibility, control, and service of your accounts. No one but authorized persons will ever have access to any of your files. You can rest easy knowing that our system will always be ready to serve you. You use information to conduct business and support your business processes. This information becomes the evidence of how your organization operates and makes decisions. Therefore, you need a document and records management system that lets your organization meet your legal obligations, both required by law and by internal practices. A document and records management system that does not help you meet your obligations creates the impression of compliance without providing the service needed for actual compliance with the law. For a free consultation on how to get a records management program in place that covers all your business needs call an Offsite representative today. We will take the pain and confusion out of the equation. Are You in need of Storage Boxes? We Can Help! 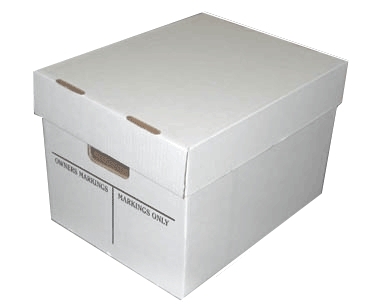 Click on Records Storage Boxes for more info!